New Books in the Gift Shop! It seems like the school year just ended and we were getting ready for our summer programming only days ago, but here we are again with another year of school upon us! Aligning with the new BC Curriculum, we’re excited to be able to offer a variety of programs and resources that help teachers bring relevant local content into their classrooms. Our local history kits, created in collaboration with SD33 teachers, are currently available to book. We have two kits, with a third expected in late 2017. 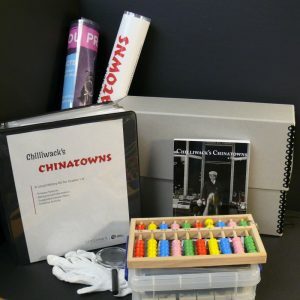 Explore Chilliwack’s two lost Chinatowns with our Chilliwack’s Chinatowns kit, containing primary source reproductions, lesson plans and supplementary resources for your class. This kit is recommended for Grades 1-6, however the primary sources can be adapted for use with a variety of grades. Follow up your exploration of the kit with an exhibit tour of Gold Mountain Dream, exhibit open until Oct. 9th. New this year is our Community of Villages kit. Recommended for Grades 6+, this kit contains 10-12 reproductions for each of five unique communities in Chilliwack: Downtown Chilliwack, Rosedale, Greendale, Yarrow, and Sardis/Vedder. Teach primary source analysis skills with this kit while introducing the historical thinking concept of continuity and change. Currently under development is our ‘Flooding Chilliwack’ kit. This kit focuses on major floods in Chilliwack which have changed the surrounding area into what we know today. Stay tuned for further details! Starting this week, our school programs are available to book online or by phone at 604-795-5210. Our popular My Community program for Grades 1 and 2 has two new community options available. Learn about key developments and events in your local area with options to focus on Downtown Chilliwack, Sardis, Yarrow or Greendale. Guided Exhibit Tours are available throughout the year. Our current exhibit, Gold Mountain Dream, focuses on Chinese immigration during the gold rush and contains local content on Chilliwack’s lost Chinatowns. Gold Mountain Dream closes Oct. 9th and our new exhibit will open Nov. 2nd. Back by popular demand is our Family Christmas program. Explore what it would have been like to celebrate Christmas in Chilliwack in the late 1800’s with hands-on activities. Browse our 2017-2018 school program brochure here and book online!